Pasley and Singer Law Firm, L.L.P. Jane Mathison is in the general practice of law including but not limited to wills, trusts, estate planning & probate law, elder law, and adoption. Jane has practiced law in Ames, Iowa, since 1977. She joined her present firm in 1979. She is a 1974 Phi Beta Kappa graduate of Iowa State University with a Bachelor of Science degree in French. She graduated from the University of Iowa College of Law in 1977. While attending law school, she worked in the Iowa Attorney General’s office and interned for the Honorable William C. Hanson in the U.S. District Court for the Southern District of Iowa. Jane practices primarily in wills, trusts, estate planning & probate law, and also family law. 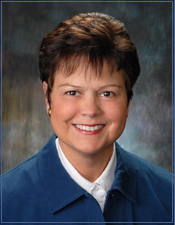 Jane served four years on the Iowa State Bar Association Committee on Professional Ethics and Conduct (now the Iowa Supreme Court Attorney Disciplinary Board) and is past president of the Story County Bar Association. Her family law practice emphasizes adoption, and she was a member of the Iowa State Bar Association Committee on Adoptions for ten years. Jane has served on the Board of Directors of United Way of Story County, Northcrest, Inc., Ames International Orchestra Festival Association, and Altrusa Club of Ames. She has actively supported the Ames School District as President of the AHS Band Boosters and Northwood P.T.A., and volunteered for the Ames Community School District Physical Plant and Equipment Levy Study Committee in 1997, the School District Five-Year Plan Committee from 1998 through 2001, and the Ames Community School District Superintendent Advisors’ Committee. From 1978 through 1989, she was an appointee of the Story County Civil Service Commission. She has also acted as a mock trial judge and offered her services to the Iowa Volunteer Lawyers Project. The offices of the Pasley and Singer Law Firm, L.L.P., are located in Ames, Iowa. The lawyers and staff of the Pasley and Singer Law Firm, L.L.P., serve clients throughout Iowa, including the cities of Ames, Nevada, Gilbert, Huxley, Slater, Zearing, Story City, Roland, McCallsburg, Colo, Cambridge, Sheldahl, Des Moines, Cedar Rapids, Fort Dodge, Waterloo, Marshalltown, Boone, Webster City, Eldora, Grundy Center, Newton, Adel, Eldora, Ankeny, Johnston, Indianola, Cedar Falls, Jefferson, Marshalltown, Clarion, Knoxville, and the communities that make up Story, Polk, Linn, Webster, Blackhawk, Marshall, Boone, Hamilton, Jasper, Dallas, Hardin, Warren, Greene, Wright, and Marion counties. © Copyright 2000-14 by Pasley and Singer Law Firm, L.L.P., P.O. Box 664, 323 6th St., Ames, IA 50010 | Phone: (515) 232-4732 | Fax: (515) 232-4756 | Email: [ Click to obtain ] | The information you obtain at our firm web site is not, nor is it intended to be, legal advice. Please consult an attorney for individual advice regarding your own situation.